You’ve probably heard the statistic that the minimum wage today in the united states is worth significantly less than it was in decades past. Although the minimum wage in the u.s. has steadily increased over time, this increase has not matched the rate of inflation, at least by some accounts. An estimate from the Center for Economic Policy Research (a fairly left-wing economics think-tank by u.s. standards) shows that apparently, the inflation-adjusted u.s. minimum wage in 1968 was $10.75 / hr, significantly higher than the $7.25 / hr we have today. These sorts of statistics are often used to illustrate that the real wage in the united states has been stagnating or falling for decades. However, these statistics are prepared for us by institutions of the bourgeoisie and petty-bourgeoisie, and they contain a particular ideological standpoint. Rather than simply regurgitate this data uncritically, we should interrogate these facts more deeply, to find out what they really mean from a Marxist perspective. The following analysis is focused primarily on the economy of the united states, and for that reason, readers should be cautious about over-generalizing the conclusions of the article. Nonetheless, the method of thinking about inflation should be applicable anywhere. Beyond its function as an analysis of the united states, this article should illustrate what sorts of questions to think about when evaluating bourgeois economic indicators in one’s own context. The first thing we should know about inflation and real wage statistics is how mainstream economists calculate inflation, and how they adjust wage rates for inflation. There are actually multiple ways in which mainstream economists calculate inflation and the real wage and the answers they get depend heavily on which method they use. We will discuss two common methods here. One of these methods is called the GDP deflator. The GDP deflator is calculated by comparing nominal GDP to what is called “real GDP.” Real GDP takes all of the goods and services “produced” in a country and sets their prices equal to what the prices of these goods and services were in some base year. The ratio between the nominal GDP (the actual price of all final goods and services “produced” in a country) and the “real GDP” in a given year is the GDP deflator. The GDP deflators in two different years can be compared to calculate inflation, and to adjust wage rates for inflation. The other (and more commonly-used) way of calculating inflation and the real wage is called the Consumer Price Index (CPI). This takes a fixed basket of goods and services based on a survey of what the average person typically consumes, and compares the prices of these goods and services in different years. Comparing the CPI in two different years can give you the rate of inflation and can also adjust wages for inflation. The CPI is used more often in inflation statistics primarily because the data is more readily available, and also because the Consumer Price Index is a more familiar category to laypeople. As we shall see, the CPI also tends to produce a view of inflation more favorable to those arguing that workers’ purchasing power has declined. What follows is a comparison between the inflation-adjusted u.s. minimum wage in 1970 to the current u.s. minimum wage ($7.25 / hr). We’ll use the GDP deflator first, and then the CPI. Clearly there is a large difference between these two calculations. If we use the GDP deflator method, the 1970 minimum wage in 2014 dollars appears to have been $7.53 / hr, meaning that the “real minimum wage” in the u.s. has hardly fallen since 1970 according to this measure (in fact the difference is almost certainly within the margin of error in the measurements). If we use the CPI method on the other hand, the 1970 minimum wage in 2014 dollars appears to have been $9.36 / hr, meaning that the “real minimum wage” has fallen quite a bit since 1970 according to this measure. If we use these inflation statistics, how we judge the state of minimum-wage workers in the u.s. depends largely on what measure we use, and unfortunately, Marx’s theory of value does not really give us a clear picture of which one of these measures is more “accurate.” In truth, a Marxist should probably think about inflation and “real wages” from an entirely different perspective. What we can take from this, however, is that there are actually multiple ways to calculate inflation, and depending on the agenda of the people reporting the statistics, they’ll be more likely to report one or the other measures of inflation. Which measure a source reports will affect the picture they paint substantially, which is something to keep in mind whenever one encounters these statistics. In simple terms, inflation is a wide-spread increase in prices across an economy. We can all agree that in the u.s. and in many other places in the world, the overall price level has steadily increased over the last several decades. That is, there has been inflation in the u.s. and many other countries for a long time. However, mainstream (bourgeois) economists and Marxists have very different explanations for why inflation occurs. Because the mainstream theory of price ignores production, the mainstream explanations for inflation also ignore production. Increases in prices across an economy are generally treated as independent of the process through which commodities are produced. This is reflected in the very measures of inflation which mainstream economists use. Both of the measures discussed above—the GDP deflator and the Consumer Price Index—effectively take commodities as given, with changes in price seen as happening to these commodities, rather than reflecting changes in the production of the commodities themselves. Primarily, inflation is seen by mainstream economists as a reduction in the value of money, which (according to the mainstream) happens independently of the process of production. In bourgeois economic theory, the value of money is determined by the relative supply of money and the demand for it.4 This value of money is one of the most frequently-cited causes of inflation. Bourgeois economists talk about the “value of the dollar” being less than it used to be, and see this as a primary driver of inflation. In particular, inflation is seen as closely tied to the quantity of money in circulation. When governments print lots of money (for example to pay debts or other government expenditures), mainstream economic theory holds that the value of money should go down, and prices should go up. For instance, this was the IMF’s principal explanation for the hyper-inflation experienced in South America in the 1990′s.5 Additionally, some years back, former head of the u.s. Federal Reserve Ben Bernanke argued that deflation or decreases in prices could be prevented by printing money and cutting interest rates (the latter being similar to printing money as it increases access to credit).6 That clearly reflected the mainstream view that the value of money and inflation are strongly tied to the quantity of money in circulation. The classic thought experiment used to justify the bourgeois view of inflation is that if we were to drop buckets of money on a population, the value of money would decrease and prices would increase. Marxists agree that if the quantity of money in an economy increased, with all other things being equal, the value of money would decrease and we would have inflation. But Marxists understand that this is not how money actually works. Our view is that money tends to be printed in order to better circulate commodities. From a Marxist perspective, in the real world, putting more money into the system does not generally increase prices. In fact, money tends to be injected into the system because prices increase, not the other way around. Money also tends to be printed when there are more commodities to be circulated, even when prices are not significantly higher. Further still, even when the printing of money exceeds increases in prices or increases in the number of commodities produced, the money that gets printed does not necessarily find its way into circulation. Currency that is effectively taken out of circulation via hoarding on the part of banks and governments does not necessarily have any effect on the value of money. The most fundamental reason Marxists reject the mainstream view of inflation is that we do not see the value of money as determined by the supply of and demand for money. Rather, when money is a commodity, the value of money is determined by the value of the money-commodity, as measured by the labor time expended in the production of the money-commodity. In modern economies, when money is not tied directly to a single commodity, the value of money is determined by the average amount of value (measured by labor-time expended in the production of commodities in general) that money is able to circulate in a given period. What this means is that, while it is possible for the value of money to decrease (and for inflation to rise as a result) if the printing of money outstrips increases in the amount of labor-time expended in an economy, from a Marxist perspective the quantity of money in circulation is not the main cause of inflation. Of course, we do acknowledge that when money is state-issued paper money, there is a greater tendency for the value of money to decrease (and for prices to rise over time as a result) than with commodity money. This is because the dominance of the credit system in modern economies tends to make credit a near-replacement for money, expanding consumers’ purchasing power. It is not hard for the level of credit in the economy to be in excess of the supply of commodities, leading to increases in market prices above “prices of production.” These raised prices can then be solidified when actual money is printed later on in order to settle debt payments.7 In plain terms, when money is state-issued paper money, there are more pressures that may push the value of money downward than with commodity money. However, contrary to some commentators, we would still hold that this is not the primary cause of inflation for the following reasons. While more money is circulated in the world economy than ever before, recent decades have also seen a massive expansion in the industrial labor force globally and a much greater incorporation of labor in the global South into the international capitalist system. Moreover, if expansion of credit and settling debt payments with printed money were primary causes of inflation, we would expect to see substantially more inflation in imperialist countries today. Countries like the united states and japan have accumulated enormous debts, and in the last few years they have been printing money at truly incredible rates. Yet recent estimates indicate that the rate of inflation is very low in both countries (about 0.2% in the united states and 2.7% in japan8). Additionally, particularly in the united states, the rate of inflation has been falling as more money has been printed. In sum, evidence seems to validate the view that the primary cause of inflation is not a falling value of money as more money is printed. If the quantity of money in the system is not the main driver of inflation, what is? For Marxists, increases in prices are principally driven by increases in production costs. These production costs are not a measure of the relative preferences of consumers for production inputs, but rather are determined by the value of inputs as measured by the (socially necessary) labor-time expended in the production of those inputs. So for example, if productivity in capital and intermediate goods sectors decreases, the value of those goods will increase and prices across the board will tend to increase (i.e. we will have inflation). The primary production cost is that of direct labor. Labor is, after all, an input to every commodity. Labor is also an input to many things which are not commodities but still have prices. Marxists conceive of the cost of this direct labor in terms of the value of labor-power. The value of labor-power is related to wages, but it is not merely equivalent to wages. It is the value of the bundle of commodities necessary to reproduce the workforce, i.e. to keep workers showing up to work. This obviously includes the value of those commodities necessary to physically sustain workers. But it also includes an expected living standard. If workers come to expect a certain standard of living, and capitalists try to decrease workers’ access to the goods they have come to expect, workers tend to strike or resist work in other ways. So the value of labor-power is effectively the value of those commodities necessary to provide workers with enough of a living standard to keep them working, which is determined by struggle between workers and capitalists, along with other historical and cultural factors. When the value of labor-power increases, i.e. when the value of goods that workers typically consume increases, prices tend to increase on a wide scale. In short, though not considered to any great extent by Marx himself, it is nonetheless completely consistent with Marx’s overall logic that an increasing value of labor-power would be a significant driver of inflation. The value of labor-power can increase for a number of reasons. Decreases in productivity in sectors producing wage goods can lead the value of labor-power to increase. But capitalists tend to strive to increase productivity as much as they can, meaning that a long-term productivity decrease in wage goods sectors is implausible as a primary explanation for inflation. The value of labor-power can also grow simply by an increase in the number of commodities which workers are typically able to consume, or by a shift in consumption patterns toward higher-value commodities. In other words, from a Marxist perspective, increasing prosperity of workers is actually a major cause of inflation. There are of course other causes of inflation and not all of them are related greater levels of prosperity. For example, South American countries experienced hyper-inflation in the 1990′s when terms of trade rapidly became unfavorable for these countries. This was severely damaging, as many of the South American economies depended heavily on imports. Additionally, when productivity has decreased or there have been other complications in the production of commodities which are central to the world economy, such as oil, there has tended to be a great deal of inflation, increasing economic hardship for large numbers of people. However, the broader point is this: given that the value of labor-power is the largest production cost, from a Marxist perspective we would expect increases in the value of labor-power to play a major role in driving inflation, even if it is not the only catalyst for inflation or even the most important one in all instances. The first thing that can be said is that although inflation can be caused by a reduction in the value of money, inflation does not necessarily indicate such a decrease. Inflation can occur even when the average amount of value that money is able to circulate stays the same. For example, if productivity decreases in an economy on a wide scale, or if productivity decreases in a sector which produces inputs for many other commodities, prices will tend to increase because the value of commodities will be greater. Though commodities will require more money to circulate, the value of money may not change, because the commodities circulated will have more value in this scenario. Second, the presence of inflation does not necessarily indicate that the purchasing power of workers is declining even when nominal wages appear not to be keeping pace with inflation. Inflation certainly can reduce the purchasing power of the work force—e.g. in the periods when inflation is driven primarily by factors other than increasing labor costs—but incidentally, inflation often occurs because workers’ purchasing power (in terms of the value they are typically able to command) has increased. It may initially seem paradoxical that inflation could actually indicate a rise in the purchasing power of the working class, when wages and prices mediate what workers are able to consume. This “paradox” is resolved however when one thinks critically about the various means through which workers are able to command value. In the first place, it is important not to just consider wages in absolute terms, but also wages as a share of national income. When comparing wages to national income, one can get a sense of the portion of the total value realized in a country that workers are able to command. Additionally, it is important to consider other forms of income besides wages. In imperialist countries primarily, workers receive a great deal of non-wage compensation in the form of health benefits, retirement packages, and the like from employers and the government. These non-wage forms of compensation increase the amount of value workers are able to command over the course of their lives. 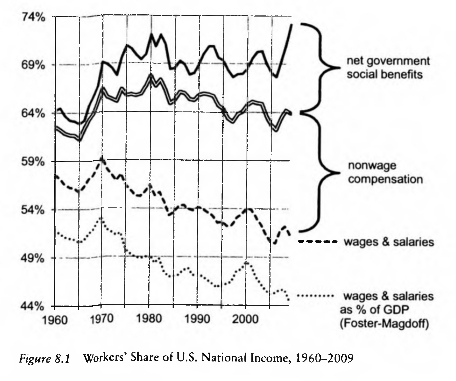 As Andrew Kliman has illustrated in The Failure of Capitalist Production, when one considers wages and salaries as a share of united states national income, one does find an overall decrease in this share between 1960 and 2008. However, when one includes non-wage compensation and government benefits, workers’ compensation as a share of u.s. national income has actually increased.9 Moreover, we know that the amount of labor performed in the u.s. economy has increased since 1960. This means that more value got circulated in the u.s. economy in 2008 than in 1960, and u.s. workers also commanded a greater share of that larger mass of value. It follows immediately from this that the amount of value typically commanded by workers increased during this period, and thus we can safely assume that the value of labor-power increased. In other words, despite increases in prices, it is clear that workers’ ability to command value has increased in the united states over the last several decades. In fact, from a Marxist perspective, this increase in the value of labor-power is likely one of the main reasons prices have increased. Of course, it is also true that wages for most people have actually risen faster than inflation in the united states, even by the rather dubious Consumer Price Index measure. But even if this were not the case (and it may not be the case for lower-income workers), non-wage compensation and government benefits have increased substantially over this period, increasing the value workers can command. It is also crucial to consider that many commodities purchased in imperialist countries are produced in the Third World, where organic composition of capital tends to be lower and the rate of surplus value tends to be higher. Meanwhile, there is relative mobility of constant capital between industries in the First World and industries in the Third World, leading to the formation of a general rate of profit between them. This creates a situation in which the prices of commodities produced in the Third World systematically underestimate their value. In other words, when First World workers purchase goods produced in the Third World, they will tend to be able to command more value than if they bought similarly-priced domestic goods. Further still, the u.s. in particular maintains a huge trade deficit with the Third World, through which it is effectively able to take goods from the Third World without giving up anything in return (a product of the decoupling of money from direct convertability to a commodity like gold, and of the fact that the u.s. dollar is the hegemonic currency). Capitalists can pass much of the benefit from this along to consumers, in the form of cheap goods priced much below their value. In sum, inflation does not necessarily indicate a decrease in the value of money, nor does it necessarily indicate that things are getting harder for workers. In order to judge the situation of the working class, one must consider the value that workers are able to command, which involves looking beyond just wages. For example, despite long-term price increases, u.s. workers’ ability to command value has increased in the last several decades, owing to expansion government benefits and non-wage compensation, and likely also to greater consumption of goods from the Third World. In the wake of the last crisis, unemployment increased substantially, and access to higher-paying jobs declined. Many people have had to settle for less in recent years. As one might expect from the above discussion, the rate of inflation in the u.s. has been extremely low, and there may even be risk of deflation in the coming years. All of this would seem to be an indication that now, in the wake of the 2008 collapse, the situation of the working class in the u.s. may indeed be stagnating or declining. Further, if patterns of previous history have any predictive power, the economy is unlikely to bounce back any time soon, and in fact things are likely to get worse over the course of the next few decades. A rise in unemployment tends to predict a decrease in the rate of inflation. 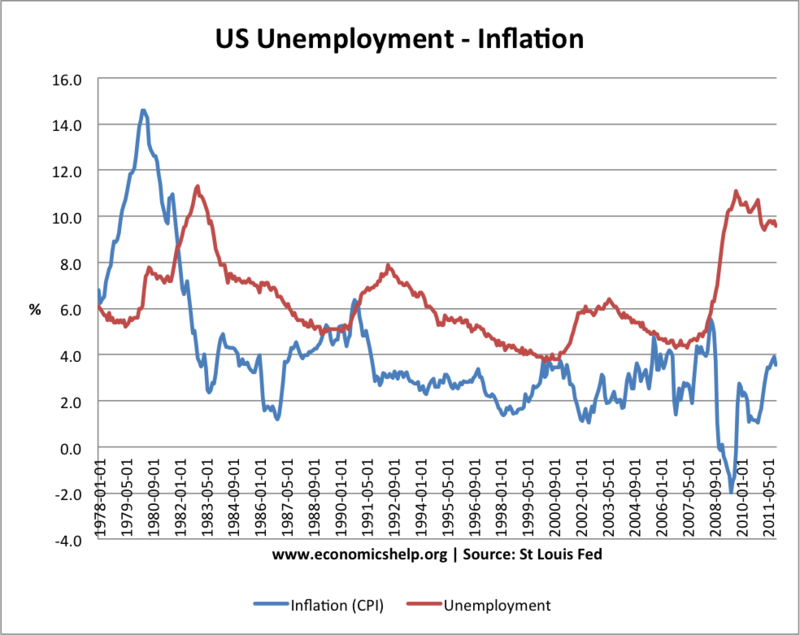 Keynesians often think that inflation causes higher employment. But from a Marxist perspective, increased employment is actually what tends to cause growth in inflation, while unemployment disciplines the workforce, leading to lower labor costs and a lower rate of inflation. What must be stressed however is that this recent period of stagnation or decline for the u.s. working class comes after a long period of increasing living standards. Furthermore, in 1960 u.s. workers already enjoyed a highly privileged existence in comparison with most of the world, and this standing increased overall in the following years until 2008. This means two things primarily: First of all, contrary to the Keynesian narrative and even the narrative of some self-proclaimed Marxists, the 2008 crisis in the united states cannot be attributed to a declining living standard for workers; it was not a crisis of “effective demand.” Rather, the crisis was a product of factors which are part of the very foundation of how capitalism works, and there is little monetary or fiscal policy can do about it. Even in the heart of the empire, capitalism cannot avoid its “boom and bust” nature. Second, contrary to the claims of some communists, the u.s. working class frankly has a long way to go before it would experience conditions comparable to the working classes in the Third World. Though the recent economic decline in the u.s. has ostensibly radicalized some people, communists should be careful to note that movements to reclaim a lost living standard are fighting to reclaim a position that was built at the expense of much of the rest of the world. What the narrative that inflation = worsening conditions does is obscure or at least downplay the significance of this parasitism, as it greatly overstates the extent to which the basis of the labor aristocracy has been undermined. In truth the privileges of the labor aristocracy are only just now beginning to be gradually eroded, and we must be sober about our strategic projections. If anything should be taken from this article, it is that economic statistics should not be taken at face value. This is not to say that looking at economic indicators is worthless. In fact, one must engage with such indicators. Although there is certainly much more to political organizing than understanding the economy, such an understanding can certainly aid in developing political strategy. In this field, economic “facts” are the raw material we have to work with if we want to produce knowledge. What is dangerous however is mistaking the mere recognition of economic “facts” for knowledge of those “facts.” When we see inflation statistics and similar figures for example, what we have to recognize is that these are prepared for us by structures in which bourgeois ideology is dominant. These economic “facts” have a bourgeois ideological content within them. It is therefore necessary for us to interrogate these “facts,” using our own theoretical and ideological framework, before we can really say that we know them. What we have hopefully illustrated is that when we do interrogate factual “raw material” with our Marxist framework, rather than simply regurgitate statistics uncritically, we generate a picture that is actually significantly different than the dominant narratives. This is crucial if we want to get a grip on the current situation in a way that can actually further our political aims, rather than playing into the politics of reactionary classes. I’ve always thought of wages going hand in hand with the rate of inflation….and the actual cost of things…for example, a gallon of gas in 1971 in Seattle was like .23 cents/ gal….when I rented a one bedroom apt on Capitol Hill in 1977 it was $ 165/mo…etc…I made $14/hr bussing tables ( with tips)…I could afford to pay my own way to the U of W..which was about $1,250 / yr or so…now…bussing tables , you might make $14/hr or actually less in many states…rents have increased hundreds of %.. gas hundreds of %…real wages for the masses have gone down relative to actual costs by an enormous factor…this is why both parents must work to afford basics to get by…if there are even two parents..minimum wage compared to actual average annual inflation is very negative compared…so I don’t really get your points about deflators and CPI….perhaps that’s economic theory and methodology but has nothing to do with real costs and wages….it’s a complete fabrication of rational. Next Post What Does a Marxist Mean by “Material”?